In a hot skillet, get that tofu golden crisp on the outside, soft inside. Add the green onions, and sauté so they take on a nice char. Stir in thinly sliced red bell pepper. Whisk together and heat the savory peanut butter sauce. Soak the rice noodles in hot water, so they soften but keep a bouncy resistance when you bite into them. Chop the cilantro and peanuts for that final pungent crunchiness and color. Did you know that green onions and scallions are actually the same thing? Call them by either name, they’re simply young onions, harvested before the white part swells into an onion. Scallions sound sexier, but like they do in the grocery store, I’m calling them green onions. 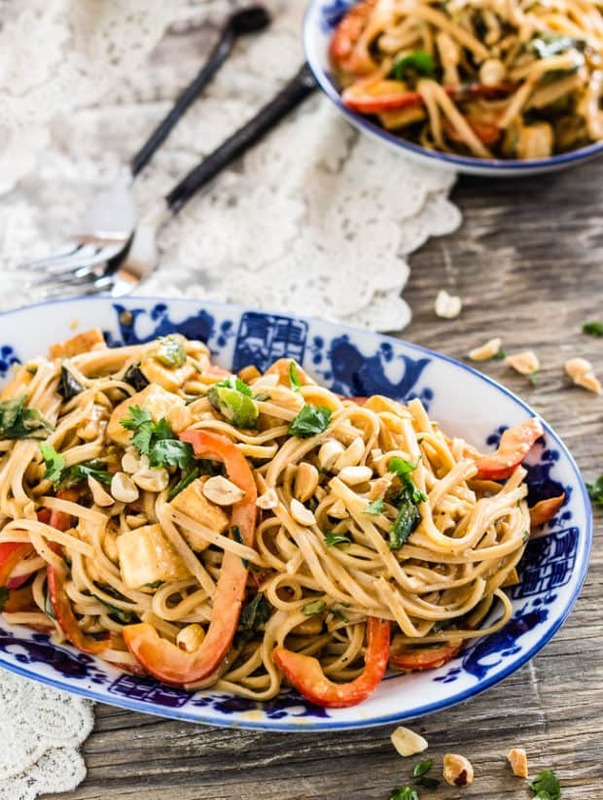 Blister green onions in a hot skillet for the essential aromatic flavor and color contrast they bring to these Thai peanut noodles with golden tofu. Interesting cookbooks with creative enticing recipes, from baking and desserts to vegetarian and vegan, have a way of making their way into my kitchen. 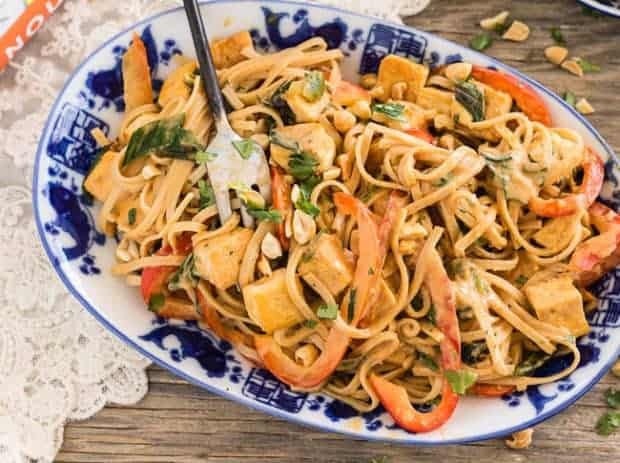 This recipe is adapted from the Beijing Peanut Noodles in Lia Huber’s Nourished: a Memoir of Food, Faith & Love. 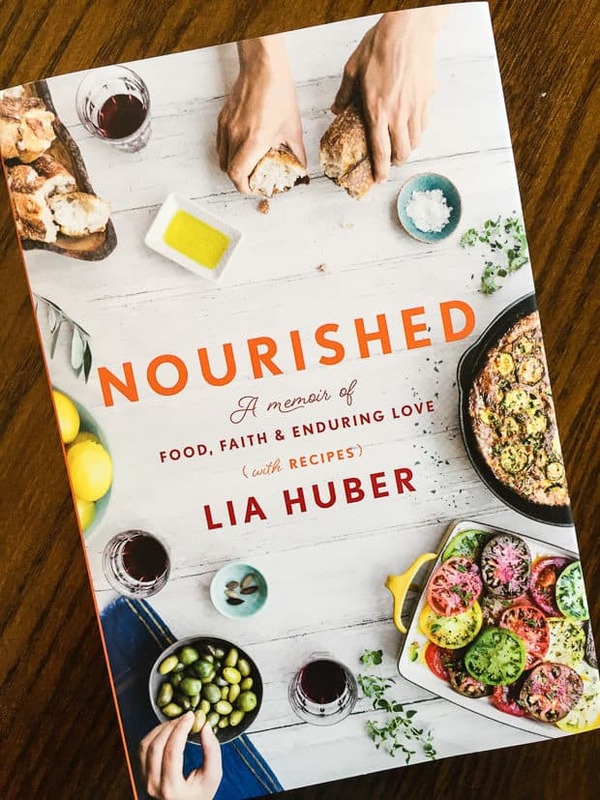 Interspersed with healthful recipes gathered from world travels, Lia chronicles her discovery of food’s nourishing power, her personal faith, her family, and her career as a food writer. Thumbing through Lia’s memoir, I decided to make her Beijing peanut noodles, then tweaked the heck out of the recipe, switching rice noodles in for linguine, and adding golden sautéed tofu. I’m pretty sure Lia will approve of my gluten-free and protein-boosting changes. Throughout the chapters, Lia’s nourishing recipes highlight her life discovery stories. Some recipes call for meat, others are meatless. Skordalia, olive oil-rich garlicky mashed potatoes made in a large mortar and pestle. Frisée Salad with Persimmons and Walnut-Crusted Goat Cheese. Pastel Imposible–chocolate cake with flan on top aka chocoflan, always a hit at parties. Many soy sauces are made with wheat. To keep this recipe gluten-free, choose gluten-free soy sauce. If you can, buy organic soy products. By definition, organic food can never be GMO, and at least 85% of soybeans grown in the U.S. are genetically modified. 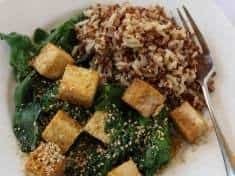 Organic tofu, edamame, miso, soy sauce, and other soy products are not much more costly than conventional, so this is not a big splurge. For the broth, I diluted ½ teaspoon Rapunzel vegetable broth powder in ⅓ cup water. The zesty peanut sauce makes a yummy dip for vegetarian spring rolls. Try it over rice and grilled veggies–a winner! Disclosure: I received a review copy of Nourished from Blogging for Books. All opinions are my own. 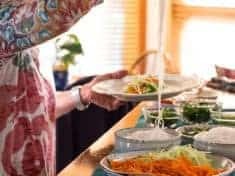 Be sure to check out Nourish Evolution, Lia’s website, where she guides readers to a richer, more delicious life, putting seasonal vegetables at the center of the plate. 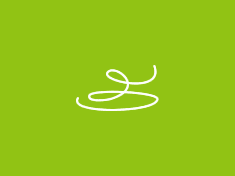 There you’ll discover more nourishing recipes, and customized healthy meal plan subscriptions. Make it a fabulous week–get in the kitchen and cook something deliciously nourishing! 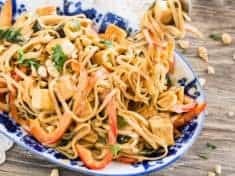 Tender brown rice noodles, crisped tofu bites, crunchy red bell pepper, and green onions, all bathed in a bursting-with-flavor sauce bursting-with-flavor peanut sauce with ginger, garlic, soy sauce, lime juice, and spicy Thai red chili paste. Makes 4 to 6 servings. 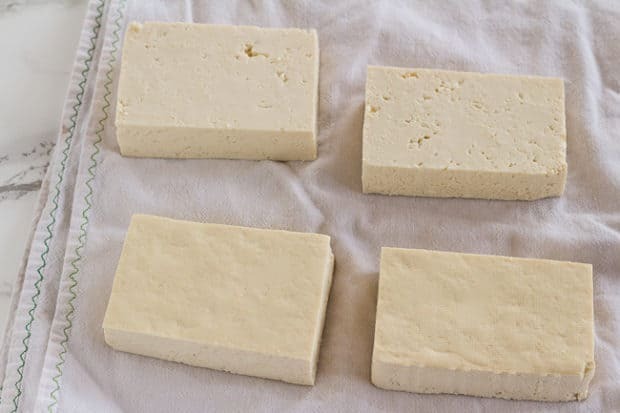 Drain the tofu, cut lengthwise into 4 slabs, and set on a clean tea towel or paper towels to soak up excess moisture. If using firm tofu, you may want to cover with the towel and put a weight on top for a few minutes. Cut into ¾-inch cubes. Heat the oil in a large, (non-stick is nice) skillet over medium-high heat. 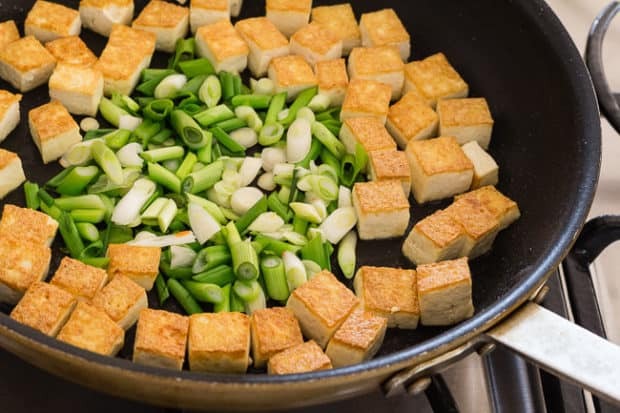 When the oil begins to shimmer, add the tofu and let cook, without stirring, until the bottoms of the cubes are golden, 8 to 10 minutes. Turn the pieces to another side and push them to the sides of the pan. If the middle of the pan seems dry, add in a teaspoon more of oil. Add the green onions and cook for 6 to 8 minutes, stirring just the onions, until they are blistered and charred in places and the tofu is golden on a couple of sides. Remove from the heat and stir in the red pepper. Set aside. Meanwhile, heat the vegetable broth, peanut butter, soy sauce, lime juice, curry paste, garlic, ginger, salt, and about 10 grinds black pepper in a medium saucepan over low heat. Whisk until smooth and heated through, about 5 minutes. Bring a pot of water to a boil. Add the noodles and remove from the heat. Let the noodles soak in the hot water until they are just tender to your tongue, 5 to 10 minutes. (If they soak too long they become gummy and break apart.) Drain, saving some of the soaking liquid. Whisk ½ to ¾ cup of noodle-soaking water into the sauce, to thin the sauce to the consistency of light cream. Taste, adding more salt if you think it’s needed. Toss with the tofu, green onions, red pepper, and half of the cilantro. Transfer to a serving bowl, or divide among individual bowls. Sprinkle with the remaining cilantro and chopped peanuts. Serve immediately. For broth, I diluted ½ teaspoon Rapunzel vegetable broth powder in ⅓ cup water.